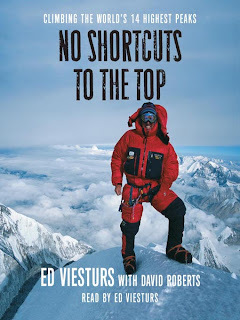 I just finished the audiobook version of "No Shortcuts to the Top" by Ed Viesturs. It currently has 4 stars from 59 Amazon reviewers. Here's Ed's personal web site. He's leveraged his unique experience to become a successful public speaker. This was a very interesting book. I know nothing of mountain climbing and it gave me a tiny taste of that world. While it was a bit more autobiographical than I would have liked, I still recommend it. I enjoyed it so much that I promptly added 3 DVDs about Everest to my Netflix queue. Two of those include Ed in them (the IMAX movie he helped film, and the NOVA show about his physiology when climbing). "Ed Viesturs—the first American to climb all fourteen 8,000 meter peaks without bottled oxygen—is an animal. A human animal blessed with enormous strength balanced by intelligence, honesty, and a heart of gold. And besides, HE IS A NICE GUY. Thanks for the review Mike. I love climbing/mountaineering books. This book sounds like a good follow-up to a book I finished a few months back called, "High Crimes: The Fate of Everest in an Age of Greed." Here you'll read about climbers placing summit attempts above human life. Sounds like Ed is an honest climber I'd like to read about. Ed's book is definitely going on my wish list.